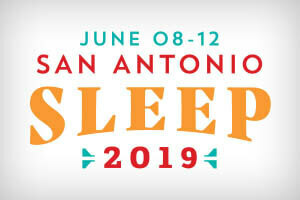 The Technologist Track is back at SLEEP 2019 in San Antonio. While this two-day itinerary is a great resource for sleep technologists and respiratory therapists, sessions are also open for all attendees to attend and learn. Review the preliminary program for a complete agenda of sessions and speakers. New this year is the add-on course, “From Downloads to Titrations: Mastering CPAP and Non-Invasive Ventilation,” which is reserved for sleep technologists and will sell out quickly. Another new opportunity this year is the Sleep Technologist Networking Breakfast, which will be held Tuesday, June 11. SLEEP 2019 registration for sleep technologists is only $175 if you are an AAASM member and register by April 26. (An additional $30 fee is required to attend the two-hour add-on course.) Sleep technologists can earn up to 38.25 continuing education credits (CECs) at SLEEP 2019.